S. W. Carty has been promoting and stocking the Fuji Leak Detection range for over fifteen years with satisfied customers the length and breadth of the country. Fuji's range of leakage detection products starts with the FSB-8 which is the smallest and must compact leakage detector available. The FSB-8 is designed for maintenance use and is an ideal additional tool for maintenance departments. Next in the line of Leak Detectors is the LD-7 which incorporates patented wind noise reduction technology to allow leakage noise to be accurately pinpointed. See LD-7 product brochure for more details. The HG-10AII high performance leakage detector is a solidly built device with over 10 years track record in the field. 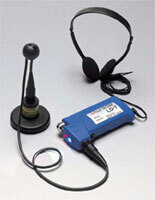 The detector incorporates highly sophisticated filters to reduce the effect of background noise and may be used with the microphone placed on the ground or on a sounding rod. Fuji's top of the range offering is the DNR18 which incorporates recently developed Digital Noise Reduction technology operated by its powerful onboard Computer Processing Unit to remove intermittent noise such as passing traffic or barking dogs. Contact us to discuss which model best suits your requirements on 01 450 8046.